Most of our date nights are spent watching our month old copy of a Netflix movie (the disc kind, not the streaming kind), on the couch, after the kids are in bed and spent with either ice cream (not anymore!) or whatever snack we can develop out of our pantry. We are working towards actually getting out of the house at some point, but I am happy to report a fun date night snack we can enjoy until that day arrives! This recipe can be found in the newest copy of Food & Wine, it’s called Black Pepper Kettle Corn, but I have added a little twist with some heat. In a large nonstick saucepan, heat the canola oil with the popping corn over moderately high heat until sizzling. Add the sugar, flaxseeds, salt and pepper, cover and cook, shaking the pan constantly, until nearly all of the kernels are popped, 5 to 6 minutes. Pour the kettle corn onto a rimmed baking sheet and let cool, tossing once or twice. Transfer the kettle corn to a bowl, leaving any unpopped kernels behind. The kettle corn can be made up to 4 hours ahead. The recipe is pretty similar to Lisa’s Kettle Corn. I wanted to give this recipe a try, because you add flaxseed to the kernels. Way to pump up the fiber! Food & Wine instructs 2 T. of sugar, but I used 3 packets of stevia instead. 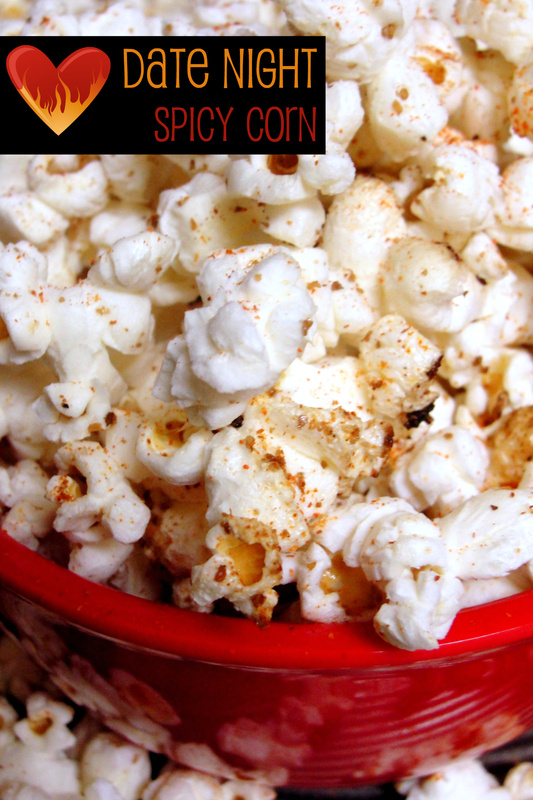 Once you have dumped the popcorn out of the pot and into its container, give it a good sprinkle of Cayenne Pepper. Hot-cha-cha! Your popcorn will be sweet and spicy and your lips will be burning.Ooh la la! Easy snack, low calorie and fiber filled and ready in less than ten minutes. Now you only have to argue over what movie to watch! Spicy corn doesn’t need much discussion, so I can use this white space to tell you about some of my new favorite reads! Real Food and Health Magazine – This is an e-zine that could use your support! Eating Well Magazine – This is a popular publication that is well worth picking up. Ketchup is a Vegetable: And Other Lies Moms Tell Themselves – Very funny mom read. The Hunger Games – Hurry, the movie is coming!!! Jessica’s Blog – I am baking her summertime lemon tea cookies for Easter at church. Shutterbean – My newest blog love. That’s enough reading material for now. I guess I’d better go tend to the laundry pile I’ve been away from all weekend. We had a family filled weekend, with my Father In-law’s retirement party on Saturday night. My sweet cousin came to the rescue and watched the boys so I could go hear him being roasted, which was pretty darn funny. 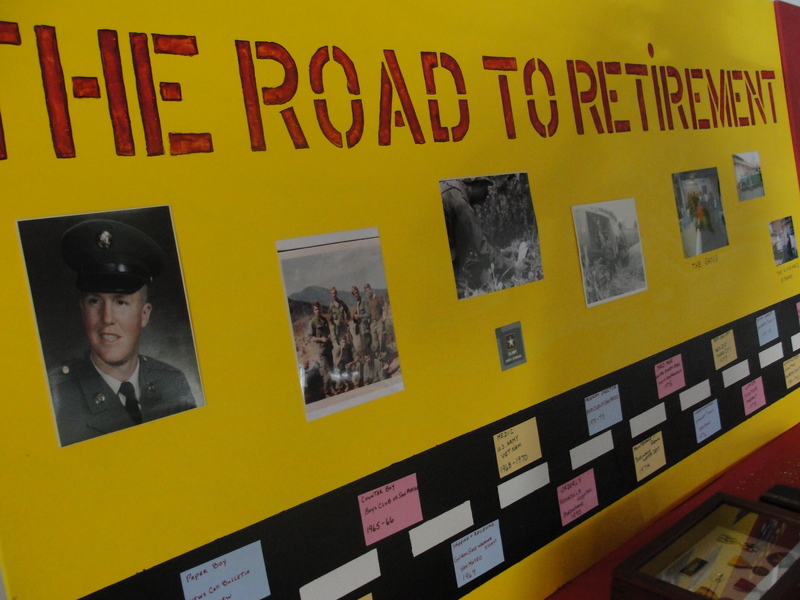 Here’s one of the big displays with my Father In-law’s photos. The first photo really freaks me out though, because this is a dead on, younger version of my husband. It totally wierd me out to think I’ll be married to my father In-law someday. 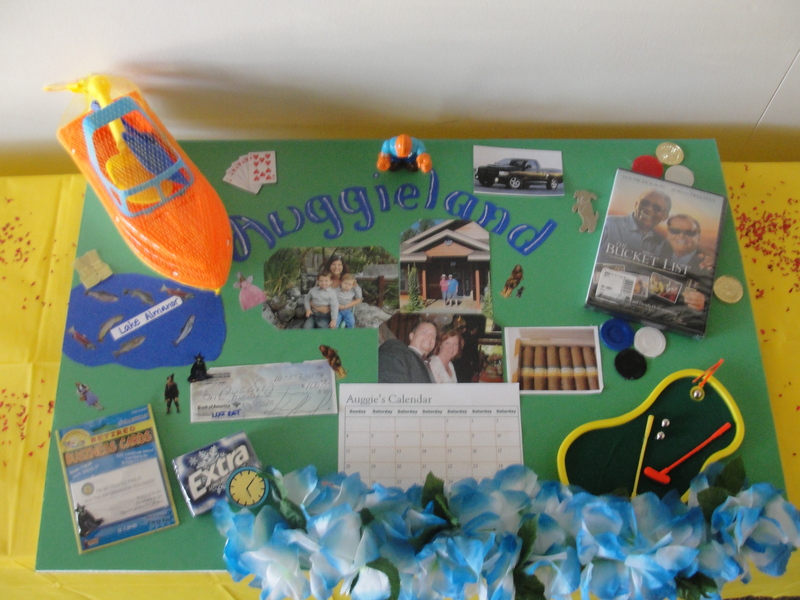 This is the jumbo card I made for Auggie. Sunday we were able to spend some time with three out of my four sweet brother in-laws and their very sweet wives. It was great for Max and Dallas to spend some time with their cousins, too. Now, I must tend to the mess I call home. Wish me more than luck.